All attacks that hit the D.D.T. are reduced to 25% damage unless fire. There is a 25% chance (2 coin throws, both heads) that the D.D.T. takes no damage. The D.D.T. 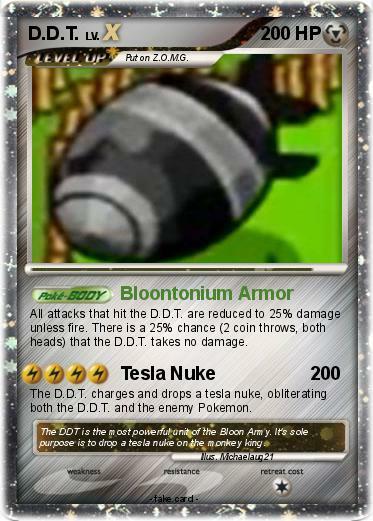 charges and drops a tesla nuke, obliterating both the D.D.T. and the enemy Pokemon. Comments : The DDT is the most powerful unit of the Bloon Army. It's sole purpose is to drop a tesla nuke on the monkey king.